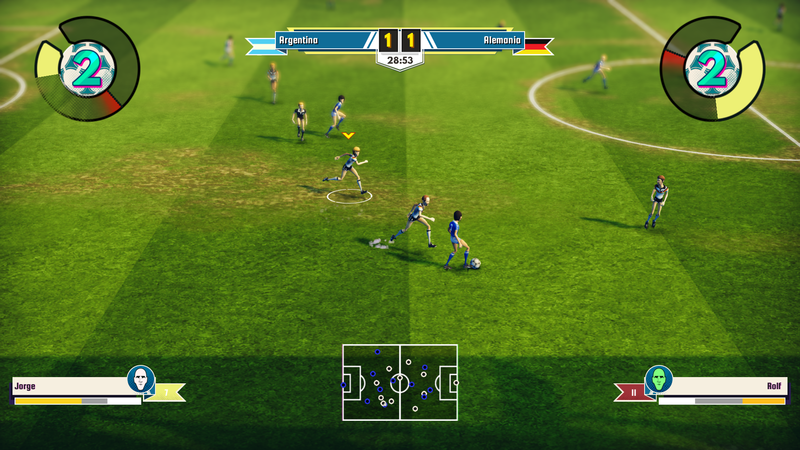 Legendary Eleven gives a new face to arcade-style home console football gaming. It’s an alternative to the more realistic football games. 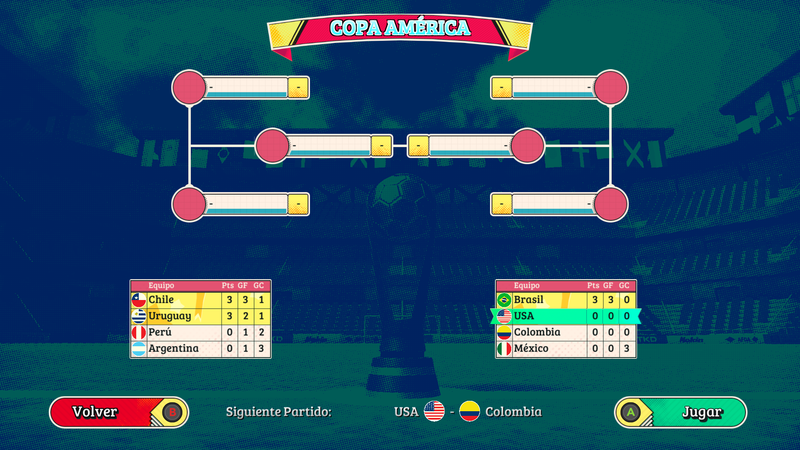 With a full roster of 36 national teams spread across 5 different cups the game holds a promise for many an hour of gaming and replay value, but does it hold up? While being an arcade-style game with simplistic controls and a very direct gameplay, it boasts some statistics worthy of mentioning. First, there is the star rating of the individual teams, based on such features as speed, defense, attack, and stamina. 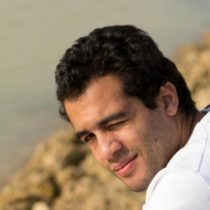 After choosing a team and going into the customization of the team line-up, one can compare the statistics of each player in the team, which won’t vary all that much though. Swapping a player out with someone from the bench is straightforward, as is changing the overall formation. Any match, being it single player, or local multiplayer is a quick setup, with very little lost time. The timer is ruthless, even while being in scoring position, once the timer reaches halftime, or the full 90 minutes shows up the ref blows his whistle; no extra time is allotted here. With tight and responsive controls matches against the CPU feel balanced enough depending on the opposing team. While defending can be something of a skill to master in many a football game or something which can be utterly frustrating, Legendary Eleven features a very straightforward, direct way of defending which makes it much more forgiving and fun. Choose between a standing or a sliding tackle with the risk of being fouled and get that ball up the pitch quickly. It’s good to see that the time-out penalty after a failed attempt balances the ease of defending. The referee is merciful and waves on most of the time, though the occasional yellow and red card will be handed out – a particular situation in which a certain sticker can help out. Once up the pitch scoring is one of the easiest things in this game and one shouldn’t be surprised to count 5 goals or more per match; choose a corner, hold down the a-button long enough and release to see your shot fly past the goalie. Not able to dribble and pass your way into the penalty area? Try a long-range shot and surprise the goalkeeper as defenders will stand nailed to the ground aghast. The audio of the game feels a bit lackluster, even though it is an arcade style game. The announcer, apart from the recurring lyrically ecstatic goal!, sounds quite flat and feels isolated in an otherwise relatively quiet setting, which cannot be mended by the grunting of players, the whistle of the referee and the life-threatening sliding tackles. The video quality is at par with what can be expected from an arcade style game, though the colors come out really nice with a retro glance and weather effects that change the look of the field. Since the first patch was released I have not experienced any visual glitches, or game-breaking elements during my play-through. The replay feature is pretty standard with some control to change it up. The caricature-like players look great, with their retro mustaches, hairdos, massive side-burns and overtly short shorts that fit right in place. With no option to change the color of the players’ clothing it can become a bit tough distinguishing them as they zip across each other unfortunately. 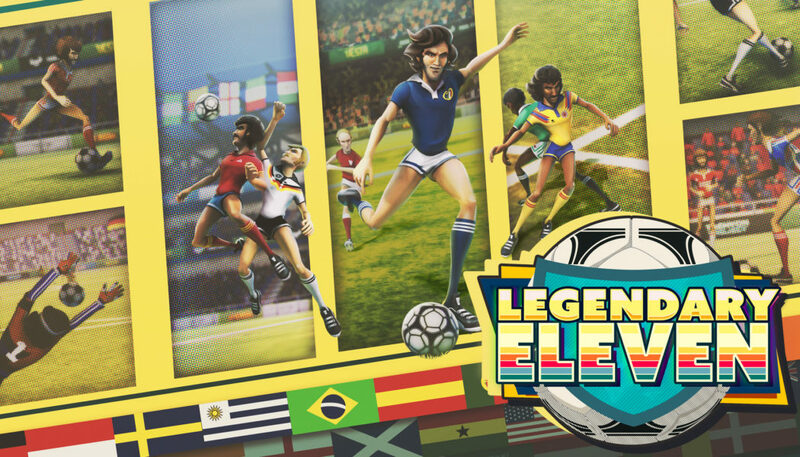 Legendary Eleven had the promise to become an addictive and competitive arcade-style football game, and ever since the first patch was rolled-out, has absolutely delivered on this promise as I find myself picking it up every now and then to play a few matches whenever I can. It is a lot of fun to play alone or in local multiplayer setting. The quick-and-dirty match setup works really well and the overall style of the game shows the passion that went into making it. 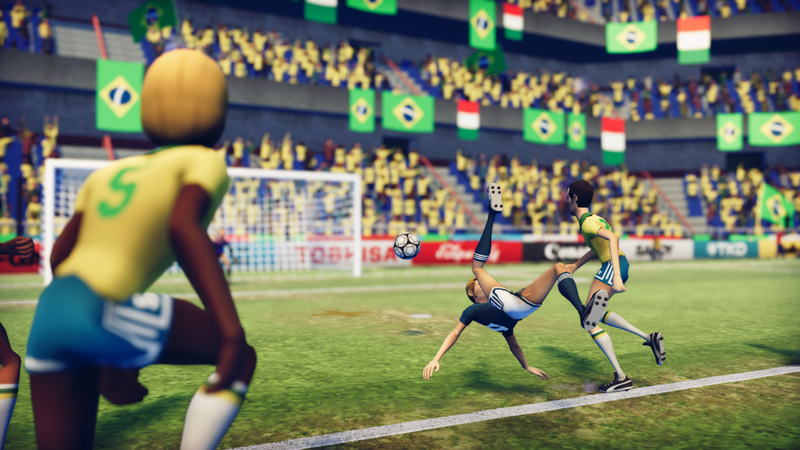 For any of you longing for an alternative to FIFA, or for those out there just wanting to play some football that doesn’t take itself too serious, this is the game for you. 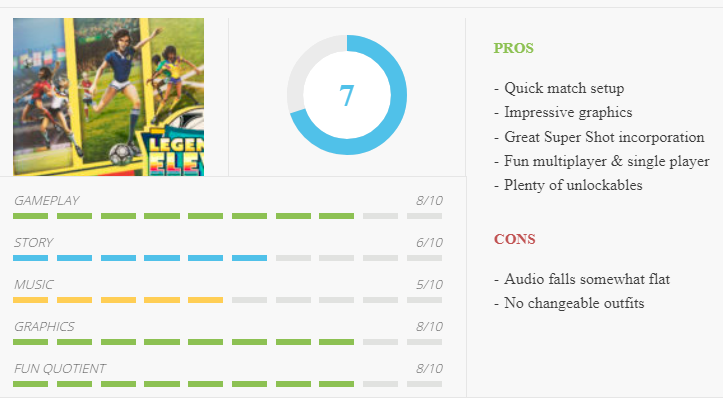 Pingback: Review: Legendary Eleven – Retro kicks!